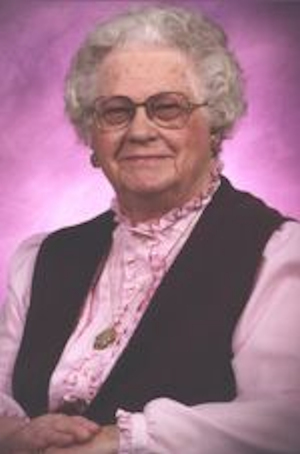 Obituary – Kodesh, Elmeta Elizabeth (Swearingen) « Perry High School Alumni Association, Inc.
Elmeta Kodesh, Ponca City resident, died Tuesday, September 25, 2007 at Shawn Manor Nursing Home. She was 93. A graveside service will be held on Thursday, Sept. 27, 2007 at 2pm in Morrison Cemetery in Morrison, Okla. Arrangements are under the direction of the Trout Funeral Home and Crematory. Elmeta Swearingen was born on Dec. 7, 1913 on a Ranch in Western Nebraska, the daughter of T.J. (Jake) and Carrie Swearingen. They lived in Morrison, and in 1927 moved to Perry. She graduated from Perry High School in 1931. In 1948 she married Charles Kodesh and lived on a farm 17 miles north of Perry. She moved to Ponca City in 1955 where she resided until her death. From 1955 to 1964 Elmeta was a beautician. She was an employee of the Quo Vadis Motel and Restaurant and was also was secretary to the owner until 1981. Elmeta was a member of the First Lutheran Church and active in the Ladies Guild of Ponca City. She was a member of the Ponca City Business and Professional Women’s Club, serving as President and District Director. In 1999 she was President of the local AARP and continued to be an active member until she was admitted into Shawn Manor Nursing Home in 2005. Elmeta’s hobbies included, playing cards, dominoes, knitting and crocheting. She also loved working crossword puzzles. She is survived by several nieces and nephews in Okla., Kansas, Mississippi and Texas. She was preceded in death by her parents, brothers, sisters and nephews. Memorials may be made to the First Lutheran Church Radio Fund, 1104 N. 4th, Ponca City, OK 74601.